. 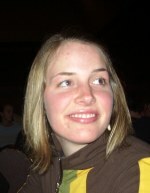 : Linnea Rudachyk :: Ski XCOttawa.ca :: Skiing in Ottawa and Gatineau Park :. If you ever need an opinion on the tragedies and upsets of our present world, turn to XC Ottawa's newest political activist, Miss Linnea Rudachyk. Linnea is a third year public affairs and policy management student at Carleton University and also an avid participant of the Nordic ski program. Previously a member of Carleton's elite racing team and a past member of the Ontario Development Team, Linnea has a strong background in junior nordic skiing. Flashbacks of her as little Linnea strenuously trying to keep up with her "oh so fast" parents have kept her determined to improve her speed each year. Now that she's caught up with her parents she's become a mentor herself to members of her past team, North Bay Nordic, and her younger sister Ava. Recovering from a past injury, Linnea's will and dedication allowed her to have a successful season in 2005 and she expects to be even faster this winter.